Taal seen from the tower of the St. Martin de Tours Basilica. Vigan or Taal? I had a bit of a discussion about this with my former student and colleague Albert Gamatero over the weekend when I took him up on an invitation to take me on a walking tour of his hometown, Taal. Not that the question is of national significance; and ideally, if one has the time and can afford it, both heritage towns are excellent travel destinations. But if one has to choose at all, then my own personal preference will have to be Taal. To be fair, my visit to Vigan was as far back as 2003. To my mind, one appeal of going to Vigan was to be able to say that one has been there. However, among my lasting impressions of Vigan were the bone tiring road trip just to get there and hopping from one gloomy heritage house to another as part of a carriage tour. The horses pulling the carriages looked pitiably small that it crossed my mind to get off ours and walk instead. In contrast, for people like me who have lived most of their lives in Batangas, there is a natural tendency to turn one’s nose up and sniff at anything in the neighbourhood. In short, travelling within the province is not travel at all. As they say, familiarity does indeed breed contempt. For most of my life, Taal was just this odd little town that we passed through on our way to my mother’s hometown of Nasugbu. I first explored it five years ago upon the invitation of one of my former players, a resident of the town. It was only then that I realised that Taal probably has as much if not more to offer than Vigan. Only a fraction of the heritage houses are open to the public; but those that are tend to be more spacious and have better lighting than those that I visited in Vigan. Exploring Taal is best done on foot and the rolling terrain is part of the attraction. There is so much to see that a day trip will not suffice. As Albert pointed out to me yesterday, even he, Taal-born and raised, still learns a thing or two about his town when goes on walking tours like the one we did yesterday. It is therefore fortuitous that I live in Lipa, just an hour away, and can keep coming back to explore some more and be back at home at the end of the day. Particularly now that I am researching the history of Batangas, I see Taal in a totally different light and with a much better understanding than when I first explored it. Unbeknownst to many, there is in fact a historical link between Taal and Vigan. Taal was the first ever locality in the island of Luzon that was explored by the Spanish conquistadores in 1570. The exploration was under the command of Master-of-Camp (Colonel) Martin de Goite and Captain Juan de Salcedo. 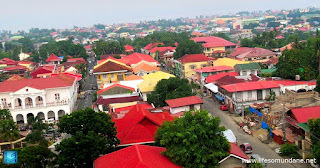 It was the latter who first explored Bombon, as the Taal Lake area was known at the time; and would also be the encomendero who would found Villa Fernandina in the north, a pueblo which would over time become Vigan. I will not go into the details of my walking tour of Taal over the weekend but instead I include the video log below. This is my first vlog and I’ll be the first to say I could have done better. Please bear with the shakiness of the video as obviously we were on foot. Even in this short clip, I believe most will understand why there is good reason for anyone to go visit Taal.